The 72-hour ceasefire which came into effect on August 11th and was supposed to expire at midnight on August 13th was broken when missiles were fired from the Gaza Strip some two and a half hours before its end. Between 21:30 and 01:00 local time, eight missiles were fired at Israel, some of which were intercepted. The IDF responded with strikes on missile launching sites and weapons facilities. Whilst a Hamas spokesman denied that Hamas had fired the missiles, other terrorist factions in the Gaza Strip claimed responsibility. “Spokesman Sami Abu Zuhri said Hamas “denies there was any rocket fire at the occupation this evening”, referring to Israel. Despite the above, a new 120 hour truce came into effect at midnight on August 13th. “Israel and the Palestinians have begun a fresh five-day ceasefire in Gaza, agreed at the end of a three-day truce. That sleight of hand – in which a denial from one terrorist organization is used to cast doubt on the fact that missiles were fired at all and thus question the validity of the Israeli response – is enabled by two factors. The first is the omission of any reporting of the claims of responsibility for the missile fire made by other terrorist factions in the Gaza Strip. The second is the failure to clarify to readers that not only is Hamas responsible for preventing all attacks during a ceasefire to which it agreed precisely because it “controls Gaza” as the BBC’s article points out, but it is clearly perfectly capable of doing so when it wishes, as shown by previous truces. That article in fact began its numerous incarnations on the evening of August 13th and it is possible to track the progress of the evolving descriptions both of that evening’s missile fire and the subsequent Israeli response. “Earlier, three rockets were fired from Gaza at Israel, Israel’s military said”. “Five rockets have meanwhile been fired from Gaza, Israel’s military says. No casualties have been reported in Israel. 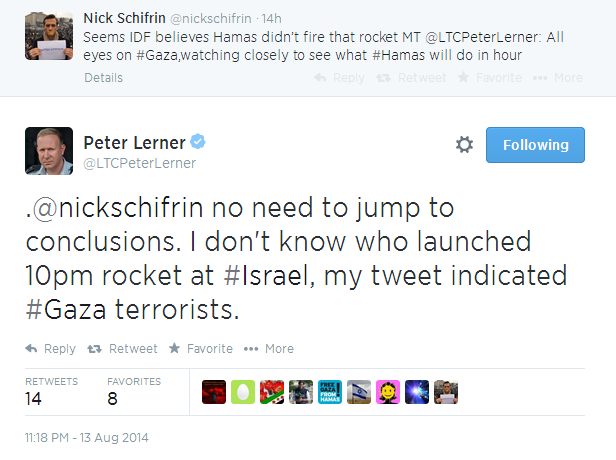 Hamas militants have denied they fired the rockets. The fourth version of the report had its title changed to “Fresh strikes follow five-day Gaza truce extension”, making Israeli actions the focus, but with the reason for them disappeared from audience view in the headline. “Israel has launched air strikes on Gaza after being targeted by rocket fire, just as agreement had been reached on extending a truce by five days. “Israel’s military said at least five rockets had been fired from Gaza on Wednesday evening. 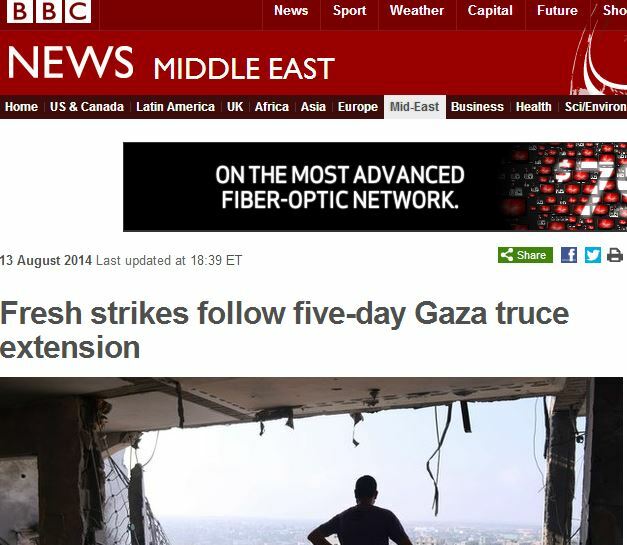 Version five ran under the headline “Israel and Palestinians begin tense five-day Gaza truce” and it was at that stage that the previous night’s missile fire (which the BBC obviously knew about because it had reported it earlier) was downgraded to “alleged”. The article then presents a selectively partial quote, presumably designed to provide back up to the previous statement. 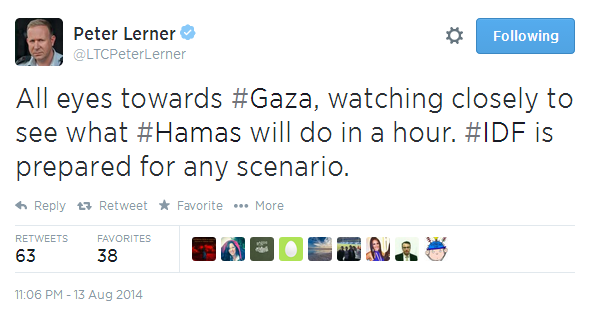 Here is the original version of the Tweet sent by Lt Col Lerner in response to Al Jazeera journalist Nick Schifrin. As readers can see for themselves, the context of that conversation puts it in a different context than the way in which it is presented by the BBC. The relevant parts of the sixth and final version of the article are identical to those in the fifth version. As we see, within a matter of hours, that article had evolved from reporting cases of missile launches from the Gaza Strip into turning them into “alleged” missile fire, with the denial issued by a terrorist organization presented as back up for that classification and claims of responsibility by other terrorists ignored, along with Hamas’ responsibility to enforce the ceasefire. The focus is instead placed on Israeli actions which are represented as a response to something which might not have actually happened. In other words, what we witness in the evolvement of this report is a clear case of facts obviously known to the BBC being tailored to fit editorial policy. 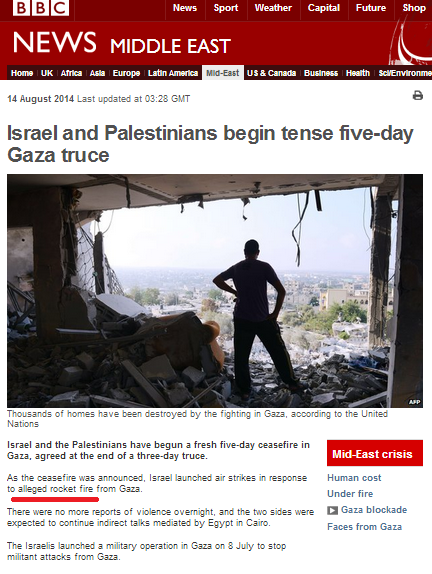 I wrote a complaint to the BBC last night as soon as I heard about the rockets breaching the ceasefire. Waiting for their STANDARD denial. . This is News? You’ve spent hours theorising over a non event. So you consider 12,000+ explosive, shrapnel-packed missiles raining down on a country the size of Wales for the past 9+ years not worthy of news, do you? What exactly WOULD constitute ‘News’ then, in your opinion? From the begining of this current round of conflict the World Service joined the Hamas propaganda machine with practically no resistance at all. Lyse Doucet kicked it off with a report that was not simply one sided but actively chose to deceive listeners by quoting a Gaza resident claiming there were no tunnels in his area and that they were an invention of the Israelis to “justify” their actions. There was no objection from Doucet and no other opinion canvassed. That set the tone for the “human interest” stories that The World Service has pumped out endlessly, never mentioning Hamas fatalities or rockets in abject obedience to instructions from Hamas. I wrote a polite email to a seriously senior individual at the World Service, quoting from Doucet’s report and pointing out that it hardly differed from a Hamas press release. He responded by claiming that Doucet’s TV report had been balanced. I replied that I was not complaining about the TV report, not having seen it, but about the World Service report. That’s where the communication ended. The rot at the BBC begins at the top.